Quantum cascade lasers (QCLs) are a type of semiconductor laser which utilizes epitaxially grown quantum wells that contain electrons in lasing states. They were first demonstrated in 1994 by the Bell Labs Team of Jérôme Faist, Federico Capasso, Deborah, Sivco, Carlo Sirtori, Albert Hutchinson, and Alfred Cho. The optical physics of a QCL differ from that of a diode laser. In a QCL the lasing transition occurs between states within a given quantum well. In contrast, in a diode laser transitions occur between the conduction band and valence band of the semiconductor material. One advantage of this construction is that the electron responsible for the emission of the photon tunnels into the next quantum well and as a result, multiple photons can be generated by a single electron, thereby making them extremely efficient. The tunneling from one well to the next is where the term “quantum cascade” comes from. Furthermore, the well depths can be engineered by controlling layer depths during the fabrication process and hence the wavelength of the lasing transition is dependent on the physical structure of the device. By carefully designing the quantum wells, lasing has been achieved at wavelengths as short as 2.75 µm and as long as 161 µm (1.9 THz). The longer wavelength devices require cryogenic cooling still, but room temperature operation has been observed to at least 16 µm. Interest has concentrated in the mid-infrared (3.5-13 µm) and the Terahertz spectrum (2-5 THz ≈ 60-150 µm). The gain profile of a quantum cascade laser can be quite broad (>500 cm-1 in select cases). By providing monochromatic feedback – either through the use of Distributed Feed Back or by constructing an external cavity (ECqcL™) – the free-running linewidth of the emission can be practicably narrowed to as little as 0.00002 cm-1 (~0.5 MHz). The natural linewidth can be as low as a few hundred Hertz. Further, in both device architectures, the emission wavelength can be tuned (through temperature or grating rotation, respectively) although the DFB is limited to only a couple of wavenumbers whereas the ECqcL™ can provide hundreds of wavenumbers of coverage. Thus narrow-band, widely tunable mid-infrared light is obtained in a single-stage, semiconductor (electrically pumped) device. At DRS Daylight Solutions, we have generated a core technology around QCL chips, coatings, cavity design, thermal management, and ruggedized design. The ECqcL™ configuration employed at DRS Daylight Solutions is shown in Figure 1. The gain chip is mounted between two collimating lenses. The patented design and placement of these lenses facilitates the collection of light from the highly divergent QCL chip. Collimated light on the right impinges on and is selectively reflected by a diffraction grating. As the grating is rotated, light of varying wavelength is fed back into the QCL chip forcing it to emit with characteristically narrow linewidth. The output is shown to the left. This so-called double-ended Littrow configuration avoids the beam walk of the more traditional Littrow cavity while improving efficiency over a Littman-Metcalf design. Further, by judicious placement of the axis about which the grating rotates, the cavity length can be precisely matched to the selected wavelength and phase-continuous (mode hop-free) tuning can be obtained. With this design, it has been possible to demonstrate >120 cm-1 of mode hop-free tuning and over 500 cm-1 of overall tuning. Figure 1. External Cavity quantum cascade Laser design. As mentioned above, QC die have been fabricated that produce light from 2.75 to 160 µm. At DRS Daylight Solutions we have packaged a wide range of these into ECqcL™. Figure 2 shows typical performance for such systems. Figure 2. 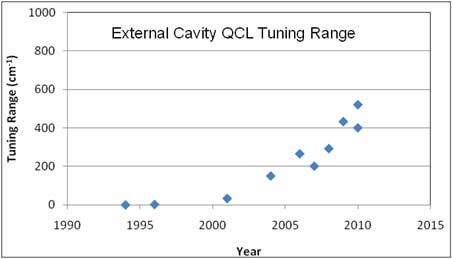 Available tuning ranges for cw ECqcL™. Many applications in the mid-IR require broad coverage in wavelength space. Fabricators have responded with a number of ways to broaden the spectral output available. The direct method is to broaden the gain in individual chips. Figure 3 is a graph of reported “broad tuning quantum cascade lasers” in the literature. As can be seen, there is an upward trend towards broader tunability and 800 to 1,000 cm-1 is probably not far off. Other researchers have worked on producing multiple gain chips on a single die. A number of applications have been well served by mid-IR quantum cascade lasers. This region of the spectrum is interesting because of a combination of two facts. The atmosphere is (at least somewhat) transparent at these wavelengths and many species of interest have strong fundamental absorptions that make it possible to detect and identify them. 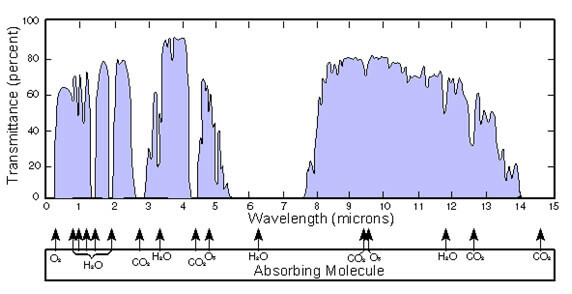 Figure 4 is a depiction of the transmission of the atmosphere in the visible through the mid-infrared portion of the electromagnetic spectrum. Significant regions of high transmission exist in the mid-IR and can be exploited to transmit powers at these wavelengths for various applications. Free-space communication, infrared countermeasures, remote imaging, beaconing, and illumination are all enabled by QCLs at an appropriate wavelength. 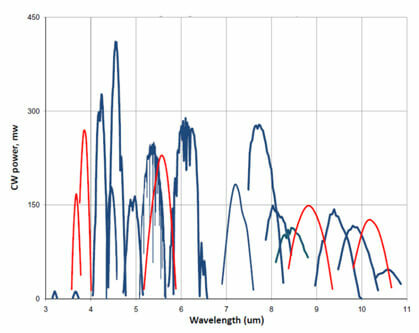 Figure 5 is a graph of the mid-infrared portion of the spectrum with a number of species placed where their strong absorptions occur. The mid-IR is rich in information for those wishing to probe, detect, image, or quantify these and many other species including explosives, nerve agents, and toxins. Detection limits in the parts per trillion range and/or discrimination between similar species are possible. Figure 4. Transmission of light through the atmosphere from the visible to the mid-infrared. The sources of the major absorptions are also indicated. Figure 5 Graphical representation of the location of strong absorptions of molecules of interest. A key application for QCLs is stand-off explosives detection. In this developing field researchers have set the ambitious goal of detecting and discriminating nanogram quantities of various explosives at distances up to 50 m with eye-safe lasers. There are a number of tactics being employed,[16,17] one approach being thermal imaging. (An interesting video on thermal imaging can be found here.) When a compound absorbs infrared light, it re-emits most of the absorbed light isotropically as heat which can be imaged by infrared cameras. Since each analyte has a unique absorption spectrum, each will heat selectively as the mid-ir source is tuned through these absorptions and may be identified unambiguously by analysis of the multi-spectral or hyperspectral data cube produced. While quantum cascade lasers serve as the engines for new techniques in spectroscopy in the mid-IR, they also can provide raw power at new performance levels. Powers exceeding 5 W have been demonstrated from single room-temperature devices. Combining performance such as this with ruggedized packaging has enabled a new generation of Infrared Countermeasure (IRCM) devices. High-power, solid-state lasers that operate in mid-infrared “atmospheric windows” can be used by pointer-trackers to disable the heat seeking mechanism employed on surface-to-air missiles, thus safeguarding soldiers in battlefield situations. Multiple “socket” architectures where a set of QCLs have been made to be collinear have been productized in militarily hardened packages. These units can produce in excess of 15 W and have completed a series of stringent environmental tests, including helicopter flight testing. Quantum cascade lasers have matured from scientific lab experiments through a technological acceptance phase and now have entered a technological dependence phase as devices have been deployed in real-world applications such as gas & explosive detection, imaging, and countermeasures that can only be serviced by this technology. The optical physics of these devices is unique and it promises to provide continuing improvements in the performance. DRS Daylight Solutions has played a pivotal role in the emergence of QCLs as reliable, high-performance mid-infrared light sources with its suite of core technologies. We are committed to continuing this leadership role. Watch the on-demand webinar, The Mid-IR Advantage, for more information on QCL technology and applications. “Quantum cascade laser,” J. Faist, et al., Science, Vol. 264, No. 5158, pg. 553, 22 Apr 1994. “InAs/AlSb quantum cascade lasers emitting at 2.75-2.95 µm,” J. Devonson, O. Cathabard, and A.N. Baranov, Appl. Phys. Lett., vol. 91, pg. 251102 (2007), and “InAs/AlSb quantum cascade lasers emitting below 3 µm,” J. Devenson, R. Teissier, O. Cathabard, and A.N. Baranov, Appl. Phys. Lett., vol. 90, pg. 111118 (2009). “1.9 THz quantum-cascade lasers with one-well injector,” S. Kumar, B.S. Williams, Q. Hu, and J.L. Reno, Appl. Phys. Lett., Vol. 88, pg. 121123 (2006). “Long-wavelength (λ≈16 µm), room-temperature, single-frequency quantum-cascade lasers based on a bound-to-continuum transition,” M. Rochat, D. Hofstetter, M. Beck, and J. Faist, Appl. Phys. Lett., Vol. 79, pg. 142548 (2001). “Investigation of the spectral width of quantum cascade laser emission near 5.2 µm by a heterodyne experiment,” H. Ganser, et al., Op. Comm., vol. 197, pg. 127 (2001). “Observing the Intrinsic Linewidth of a Quantum-Cascade Laser: Beyond the Schawlow-Townes Limit,” S. Bartalini, S. Borri, P.Cancio, A. Castrillo, I. Galli, G.giusfredi, D. Mazzotti, L. Gianfrani, and P. De Natale, Phys. Rev. Lett., vol. 104, pg 083904 (2010). “Spectrally Narrow Pulsed Dye Laser without Beam Expander,” Littman, M.G. and Metcalf, H.J., Appl. Opt. 17, pg. 2224 (1978). “Grating-Tuned External-Cavity Quantum-Cascade Semiconductor Lasers,” Luo, G.P., et al., Appl. Phys. Lett., 78, pg. 2834 (2001). “Broadband Tuning of External Cavity Bound-to-Continuum Quantum-Cascade Lasers,” Maulini, R. et al., Appl. Phys. Lett. 84 (10), pg. 1659 (2004). “External Cavity Quantum cascade laser Tunable from 8.2 to 10.4 µm Using a Gain Element with a Heterogeneous Cascade,” Maulini, R., et al., Appl. Phys. Lett., 88 (20) pg. 201113 (2006). “Heterogeneous High-Performance Quantum-Cascade Laser Sources for Broad-Band Tuning,” Wittmann, A., Hugi, A., Gini, E., Hoyler, N., Faist, J., IEEE J. Quant. Elec., 44 (11), pg. 1083 (2008). “External Cavity Quantum cascade laser Tunable from 7.6 to 11.4 µm,” Hugi, A., et al., Appl. Phys. Lett., 95, pg. 061103 (2009). “Extremely sensitive detection of NO2 employing off-axis integrated cavity output spectroscopy coupled with multiple-line integration spectroscopy,” G.N. Rao and A Karpf, Appl Opt., Vol. 50, pg. 1915 (2011). “Quantum cascade laser-Based Photoacoustic Spectroscopy for Trace Vapor Detection and Molecular Discrimination,” E. Holthoff, J. Bender, P. Pelligrino, and Almon Fischer, Sensors, Vol. 10, pg. 1986 (2010). “Standoff photoacoustic spectroscopy,” C.W. Van Neste, L.R. Senesac, and T. Thundat, Appl. Phys. Lett., Vol. 92, pg. 234102 (2008). “Stand-off detection of trace explosives by infrared photo-thermal spectroscopy,” R. Furstenberg, C. Kendziora, M. Papantonakis, S.V. Stepnowski, J. Stepnowski, V. Nguyen, M. Rake, and R.A. McGill, Proceedings from the IEEE Conference on Technologies for Homeland Security (May 2009). “Room temperature quantum cascade lasers with 27% wall plug efficiency,” Y. Bai, And Bandyopadhyay, S. Tsao, S. Slivkin, and M. Raseghi, Appl. Phys. Lett., Vol. 98, pg. 181102 (2011).